On July 3 rd, 2014, in the administrative center of the district, Hoang Liet precinct, Hoang Mai district, the "85 years of Vietnam Trade Union - 60 years of construction and development" contest was held in Hoang Mai district. Employees of enterprises, administrative units in Hoang Mai district - Hanoi. Trade Union TrungThanh Company is one of the participating units in this meaning contest. 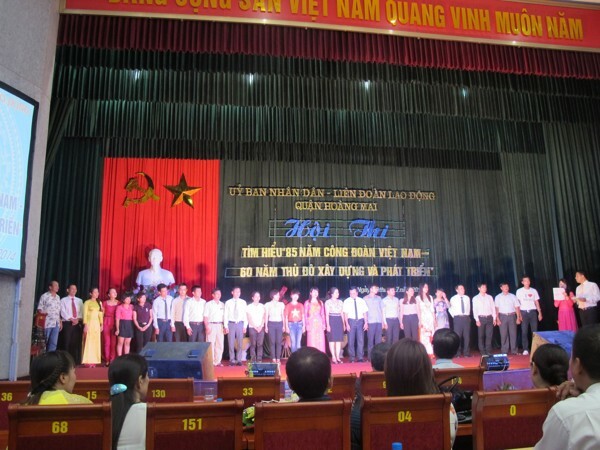 The contest is a political activity useful in the spiritual life of officials, unionists, workers and employees, aimed at propagating and educating cadres and employees to better understand the Vietnamese trade union South through the history; This will contribute to the transmission of the contents of the Resolution of the XIth Congress of the Vietnam Trade Union, the Constitution of 2013, the Labor Code, the Trade Union Law in 2013 to the laborers. Contest topics focus on the main contents such as the history of formation, construction and development of the working class and the Vietnam Trade Union; the role and mission of the history of the Vietnamese working class; The Party's policy on building the Vietnamese working class, heroic capital, thousand years of civilization. Part 1: Choose multiple choice questionnaire with 10 question packages equivalent to 100 points. Part 2: Case study. Teams in turn pick up questions and answers, the remaining teams have the right to click the additional reply bell if the team answered short. The judges commented and graded. Part 3: The self-selected gift for each team. With the efforts to learn about Vietnam's trade union, TrungThanh's team consisted of 3 members: Nguyen Thi Thanh Tam (Finance and Accounting Officer), Nguyen Thi Loan (Deputy Head of Coordination Unit), Le Ngoc Lan (Supervisor of Supermarket) won the consolation prize for TrungThanh Trade Union. Trade Union TrungThanh always actively respond to the movements, cultural activities, politics, society set by Hoang Mai District and the city.